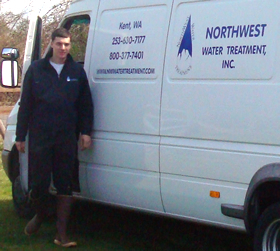 About Water Filtration & Treatment Specialists Northwest Water Treatment, Inc., Kent / Seattle, WA. Northwest Water Treatment, Inc. is a family owned, father/son business founded by Glenn Karn in 1996. Glenn’s son, Derrick Karn, does water system installation and service. Glenn has worked in water treatment industry in 1973 specializing in water testing and analysis, water system design, manufacturing, installation, service, and warranty service. His specialties included designing systems for residential water conditioning, commercial/industrial softening and filtration, ultra-pure water systems for computer chip manufacturing companies, medical water treatment systems for kidney dialysis, and municipal iron/manganese removal systems. Home owners and small communities using well-water, and commercial, industrial, and aquaculture companies in Washington, Idaho, Oregon, and Alaska. We have over 500 water system installations. Washington contractor license for water conditioning equipment #CC NORTHWT994OK which includes plumbing installation. Contact us to speak with a water quality specialist if you are interested in improving water quality at your home, community, business, or aquaculture company. 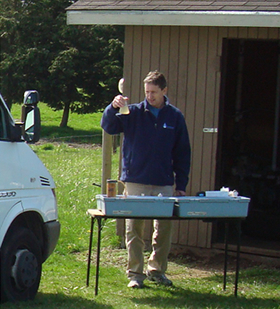 conducting on-site water quality testing.